I seem to be eating rather a lot of cauliflower this month. This maybe be partly due to the fact that I wanted to cut out the meat this month (except for Saturday night steak which is sacrilege in our house). So cauliflower seems to be a very versatile substitute. 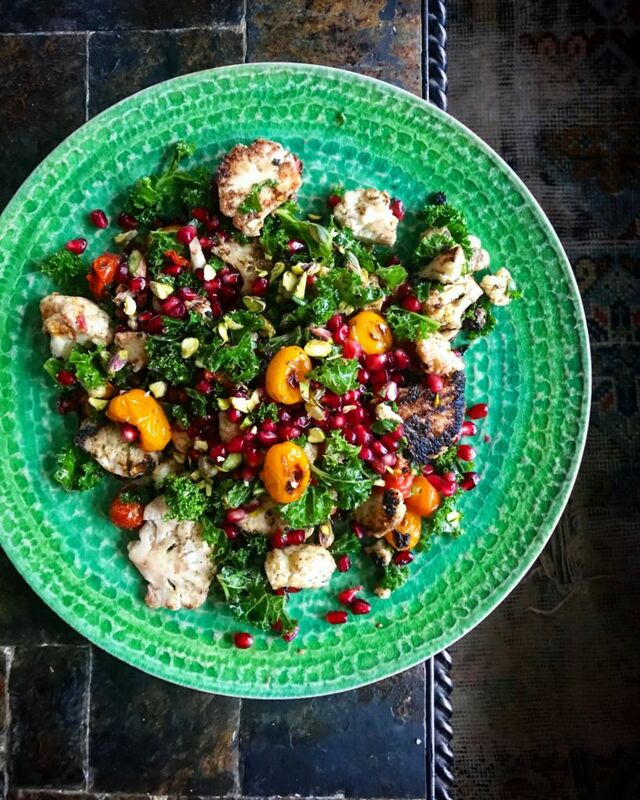 Curries, tagines and even pizzas bases, all seem to have cauliflower popping up on the menu. 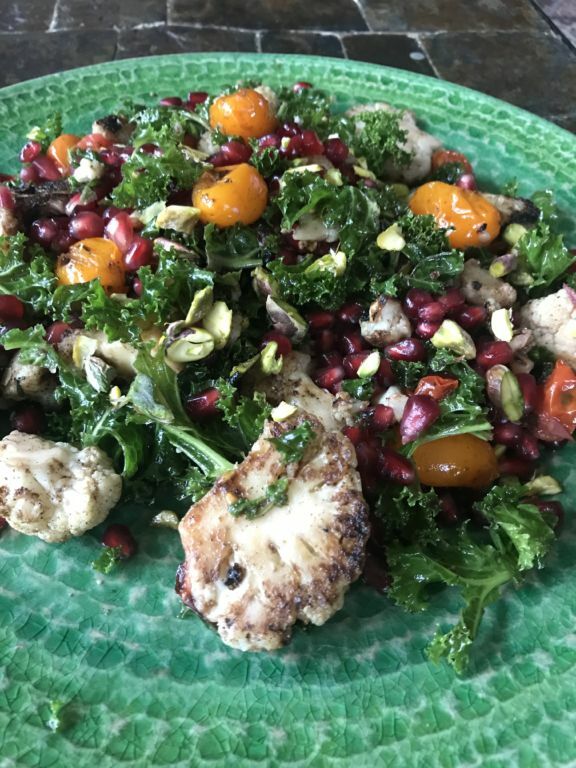 One of my favourite ways of eating cauliflower is in a salad. Blitzed to a crumb it is a fantastic, veggie, gluten-free alternative to couscous, or use just the florets which can be charred slightly, giving them a wonderfully nutty taste, as in the salad below. 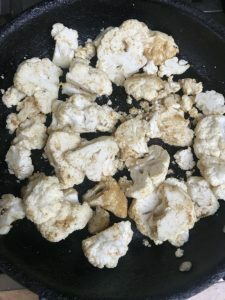 Slice the cauliflower into flinger thick slices then cut out and remove the centre stalk (don’t throw the stalk away as it tastes great when thinly sliced and added to a stir fry). Place the sliced florets in a bowl with the sunflower oil and cumin, season with a little salt and pepper and mix well. Heat a large frying pan then cook the cauliflower in batches, for 2-3 minutes so that it is slightly charred on both sides. Remove from the pan and place in a bowl. Return the pan to the heat and add the tomatoes, sprinkle with a pinch of salt and cook for 2-3 minutes until the tomatoes just begin to ‘pop’, remove from the heat and add to the cauliflower. (Take care not to over cook the tomatoes or they will turn to mush). Place the kale in another bowl and add a tbsp of pomegranate molasses and the sesame oil. 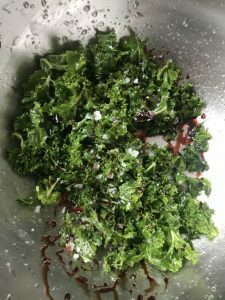 Season with salt and pepper and then using you hands, massage the dressing into the kale (this tenderises the kale) and add this to the salad. Cut the pomegranate in half then using the back of a rolling pin or wooden spoon, bash the seeds out of the pomegranate into the salad. Mix the salad together, check the seasoning then arrange on a large plate or bowl. drizzle a little more pomegranate molasses over the top and a few drops of sesame oil and sprinkle over the chopped pistachios before serving. 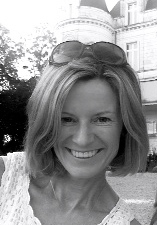 Having worked as a professional chef for over 30 years, specialising in Italian, Japanese and Thai food I like to create food that not only tickles your tastebuds, but puts a smile on your face as well! 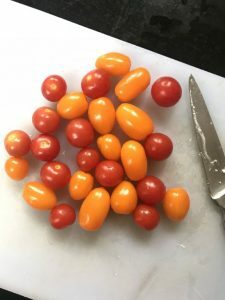 My recipes are designed not only to be easy, nutritious and delicious but more importantly they contain just a few key ingredients which you can find in your local shop or supermarket. This blog is to all you foodies out there. The recipes not only work but are easy, often quite cheap and always delicious.